Ko-go Kumite is a specific form of Kumite competition which designates competitors as either Offense or Defense at the start of each match. Competition is divided into six matches. Each competitor is designated "offense" three times and must initiate attack. The other competitor is designated "defense" and must respond to the attack, Remark: Aka (Red) side attacks first and attacks three times in a row, followed by Shiro (White) side. In cases of "Han-soku", "Shi-kkaku", Doctor's Stop or Withdraw, no more matches take place. Opponent is declared the winner. In case of a tie (when the points are equal), then the "Kettei-sen" match takes place in which each competitor attacks and defends three times, but this time, alternately initiating the attack, beginning with Aka (Red) side. In case one side scores "Waza-ari" or "Ippon", then that side is declared winner. If no "Waza-ari" or "Ippon", then total score determines winner. If score is still tied, then the court judges decide on the winner by Tsu-mae decision. Shu-shin first announces "Offense" side by showing with left hand to the athlete’s left side position Aka, pronouncing orally Aka, Ko-geki, Ikkai. Hands movement: left hand is fully stretched toward Aka in the level of chest, and after that, banding in the elbow joint initial position which is parallel to the floor. After that, fully stretched with the finger in upright position showing the first attack (Ikkai). This is repeating with two fingers for the second attack (Ni-kai) and after that, the third time, three fingers for the third attack (San-kai). Must begin attack within 10 seconds after "Hajime". After 1 0 seconds and no attack is initiated, this is recognized as "Jikan". When "Offense" side's leading hand comes within estimated touching distance of 'Defense" side's leading hand; then "Offense" side cannot hold both hands more than 45 down or hide both hands behind body line. If so, this is recognized as "Kakushi". After last technique and "Defense" side blocks and counterattacks, "Offense" side can shift or block and counterattack only one time. If "Defense" side's initiates technique before "Offense" side attacks: this is recognized as "Saki". If either side's leading hand can touch opponent's hand (touching distance), then, there is no need for "Defense" side to wait for actual "Offense" side to initiate defensive counter. In this case, "Defense" side can, in place, touch without body shifting "Offense" side's leading hand then initiate technique. If "Offense" side has executed 4 attack techniques and "Defense" side only incompletely or ineffectively blocks (shifts to escape, this is recognized as "Nige-tai". When "Offense" side, using combination techniques, stops continuation within combination. When "Defense" side blocks or shifts but counterattack is not continuation of blocking or shifting movement. When "Waza-ari" or "Ippon" is recognized. At the completion of all six matches (three offense and three defense for each competitor), the Shu-Shin confirms score with the Kansa, and then declares the winner. In case of tie score, immediately begin "Kettei-sen". Bring both hands together to backside of body. "Offense" side flag moves to back side of body. Index finger shifting from “Defense” side to “Offense” side. Top of flag shifting from “Defense” side to “Offense” side. "Defense" side flag, while, pointed straight up, moves to side of body. Bring both palms together, fingers up, in front of chest area. Bring both flagpoles together, tops pointed up, in front of chest area. 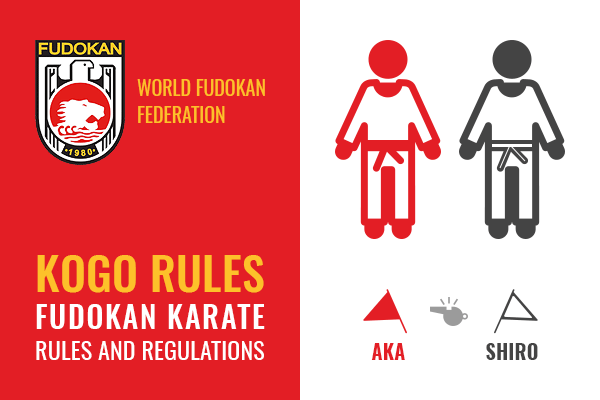 Regulamentul de karate "KOGO RULES - International Fudokan Karate Rules and Regulations" by World Fudokan Federation, publicat in 2012, poate fi vizualizat sau descarcat si in format PDF accesand acest link.